President Donald Trump, after asking the crowd at the Conservative Political Action Conference (CPAC) for permission to go off script Friday, read the entire 1963 “snake poem” he used to such effect on the campaign trail. Trump used the poem frequently as an allegory for the Syrian Refugee Crisis and “generous” immigration policy that puts the interests of foreigners above that of Americans. 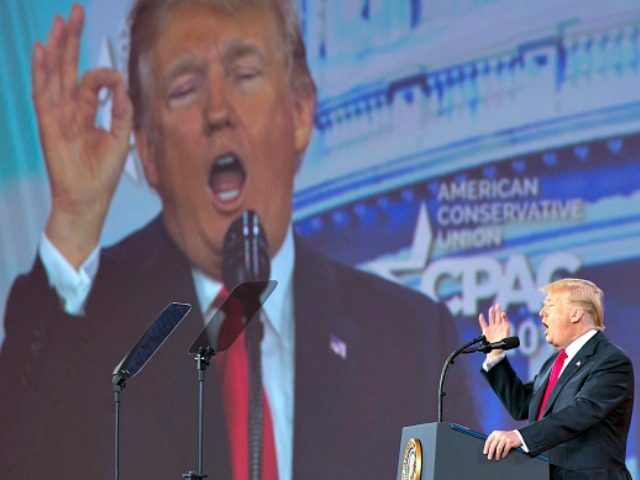 At his second CPAC address as president Trump turned away from the teleprompters, pulling what appeared to be a copy of The Snake out of his pocket from the CPAC podium at the Gaylord Resort and Convention Center at National Harbor outside Washington, DC. “And that’s what we’re doing with our country folks. We’re letting a lot of people in, and it’s gonna be a lot of trouble. It’s only getting worse,” Trump said, putting the paper with the lyrics back in his suit pocket.